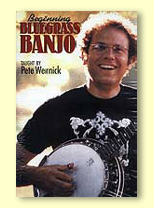 Learn to tune the banjo. If you can't do it very well, find someone who can teach you to do it. 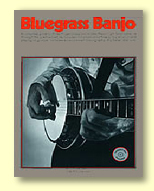 (pp 9-10, BG B) Before playing, you must always get the banjo in tune. Learn several songs. 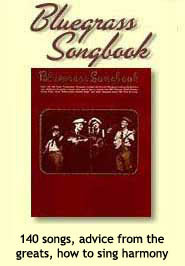 With either a songbook or a teacher, start with songs using just G and D7, then try some with G, C and D7 (pp 14-17, BG B). Brush or strum the strings any way that feels comfortable and sing along, or at least say or hum the words to yourself. To consider a song "learned", you should be able to play through it smoothly without stopping and without looking at written music. Learn some more songs and some more chords. Learn at least a dozen or so songs before going on to Phase Two. Learn how to transpose songs from one key to another (p 12, BG B), so you can learn songs not presented in G in a songbook. This will also enable you to put songs into C or other keys when they're hard to sing in G.
While it's not a necessary learning step yet, you can now play with other musicians. Doing just that will help your playing in a variety of ways. If you have the chance, do it! Learn two rolls (p 19 BG B). To consider a roll "learned" you should be able to play it perfectly, continuously six times in 15 seconds, without looking at written music. Learn two elementary solos from tablature (pp. 25-28 BG B). Commit a measure or two at a time to memory. To consider a song "learned" you should be able to play a 16-measure solo in 25 seconds, smoothly and accurately, without looking at the tablature. Goals of Phase Four: This phase is the critical point where in my estimation a person crosses the magic line over to "bluegrass banjo player". 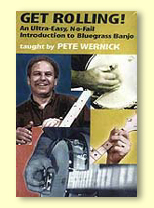 Using a three-finger roll to play a simple melody line surrounded by other notes, is the essence of the bluegrass banjo style. At this point you've got it and everything else is embellishment! Pacing: Since this learning step is a jump in learning, and not based just on memorization and practice, it is hard to predict how long it may take someone to truly learn it. For a somewhat dedicated student it shouldn't take longer than a year. It could take as little as a week or two if you've got the momentum and you're gung-ho. Learn how to hammer-on, first on a single picked string, then as an embellishment on the first note of a roll (p 29 BG B). Be careful that the hammer-on doesn't affect the even right hand flow of notes. Pacing: If a somewhat dedicated student avoids rhythmic difficulties adding the new moves in, it shouldn't take more than a week or two to incorporate them comfortably. As in Phase Four, it's a good idea to have a better player listen to you and let you know if you have rhythm problems.